Recently, I wrote two articles about Eating Our Way to Literacy. I suggested ideas for starting our own family recipe books, and voila! 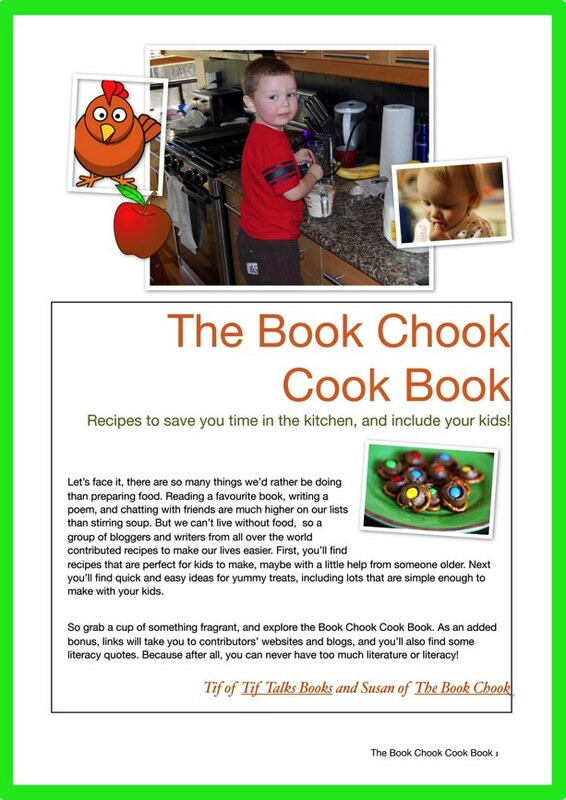 somehow, the Book Chook Cook Book was born. It's available to you as a free pdf from my website right now. I think you'll enjoy the quick and easy recipes, most of them simple enough to make with your kids. Many thanks to the generous contributors, and especially to Tif of Tif Talks Books whose eagle editing eyes spotted my typos, and who compiled the Cooking with Kids section. 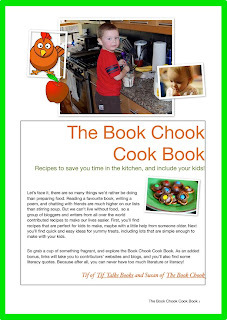 The Book Chook Cook Book fun does not have to end here. I would like to invite you all to Tif Talks Books to share your own recipes, cooking literacy tips, pictures of cooking with kids, and so much more. Don't hesitate to incorporate literacy into your daily lives and share your creativity with the rest of us! Simply click on the icon in the left-hand sidebar at Tif Talks Books for the direct link in sharing more, whether it be Simple Cooking or Cooking with Kids. YAY! It's here! Do you mind if I put a link to this post on my Food section of my blog? Mind? I'd be delighted! Would it qualify as a giveaway on Australian minute? I hoped you would enjoy the final cartoon, starring some rather gorgeous kidlets! Love that read aloud message, Kelly! Love it! I''m sending the link over to my sister-in-law right now! Thanks, Molly, and for the tweet too! A brilliant idea and book! Thank you for sharing it with us digitally! You're most welcome, Kelly T!